Finally, an elegant, lightweight, and durable porcelain tile suitable for use in aircraft, boats, and RVs. Stile® Porcelain slabs measure 118”x59” and 126”x63” and are available in 13 colors that mimic natural stone. 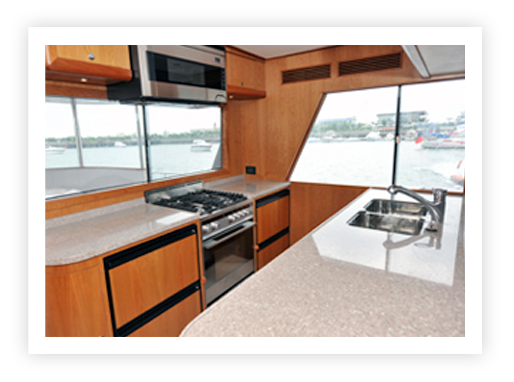 Since granite and marble slabs can weigh anywhere from 600 pounds to more than 1,200 pounds, they are simply not a viable option for most aircraft, boat, and RV design projects. However, a Stile® Porcelain slab weighs only 2.8 pounds per square foot versus 3 CM granite's weight of 19 pounds per square foot. Do the math, and you'll immediately see why Stile® Porcelain is a good fit for vehicles that fly, float, or move on down the highway. Durable and elegant, Stile® works as flooring, countertops, tabletops, backsplashes, shower and tub surrounds, and as stunning accent walls. With minimal grout lines, the continuing porcelain surfaces are easy to keep clean and maintain, while visually expanding a space. Opt for Stile® and get the beauty of natural stone slabs for a fraction of the cost. Stile® is easy to cut and install and is engineered to be installed over existing surfaces during remodels. Lightweight and durable, MSI’s Stile® Porcelain slabs are ideal for projects where traditional natural stone is simply too heavy.